Adventurous self-drive through some of Southern Africa’s most impressive landscapes & great wildlife viewing. Two friends were looking for an adventurous self-drive trip. They wanted to do something with a wow factor to a place nobody they knew had travelled to. Having been to Namibia myself I knew this would tick all the boxes for them; good infrastructure for self-driving, wildlife, coastline, mountains, quad biking and a country much less explored than it’s South African neighbour. This is a short trip for a Namibia self-drive holiday, but it captures some of the very best bits of the country without trying to do too much. Villa Violet is a smart and attractive 6 room guesthouse tucked away in a quiet neighbourhood of northern Windhoek and is a great place to start or end your safari or self-drive holiday in Namibia. You will easily find Villa Violet coming from the airport; it is close to the central areas of Windhoek; and you are within stumbling distance from the legendary Eisbein and stein of Joe’s Beerhouse. Founded in 1892 as the main harbour for German South West Africa, Swakopmund is often described as being more German than Germany. Now a seaside resort, Swakopmund is the capital of the Skeleton Coast tourism area and has plenty to keep visitors happy. The quirky mix of German and Namibian influences, colonial-era buildings and the cool sea breeze make it very popular. Swakopmund is a great place from which to organise sand-boarding or quad biking on sand dunes right behind the town. 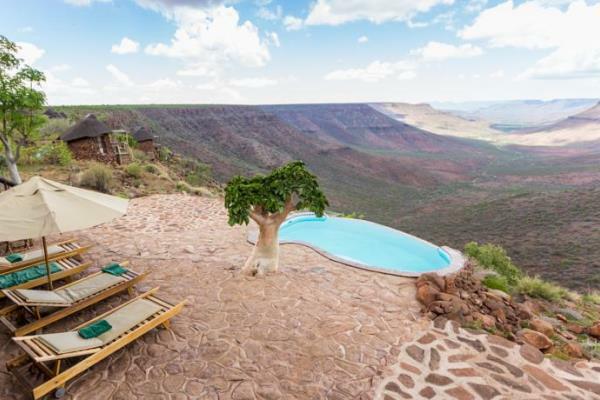 At Grootberg Lodge, 16 rock and thatch chalets gaze out over the Klip River Valley, where Black Eagles hunt just below your private deck. From here you can go on organised Rhino & Elephant tracking trips, walks on to Etendeka Plateau and visit a Himba village. Ongava is one of the largest and most exclusive games reserves in the southern part of Etosha National Park. It offers an authentic and comprehensive safari experience, including nature walks and game drives, as well as luxurious accommodation. The reserve is home to – among others – lion, eland, black-faced impala, Hartmann’s mountain zebra and a variety of other antelope species. It is also one of the few private reserves in Southern Africa where both black and white rhino can be observed. Birdlife is plentiful at the reserve, with over 340 species recorded in the area. The resurrected former farmstead that stands on the site now forms the centre of a charming camp fronting onto a productive waterhole. The 18 en-suite tents are raised on decks. It’s an eco-sensitive environment which provides an authentic, safe and down-to-earth experience for independent travellers to the Etosha region. Activities include morning and/or afternoon game drives in Etosha National Park, and morning and afternoon/evening drives (on request) and nature walks on Ongava Reserve. The sunken hide at the waterhole in front of camp is an excellent place from which to watch wildlife coming down to drink. Arrive home the following day.